These didn’t want to upload with the original post. I guess if you’re talkin’ stash you should have the pics to show too! 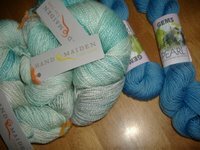 Here is the Hand Maiden and Louet that I picked up at Lettuce Knit.